In the fifteen years that we've been buying Albert Jake's handmade jewelry, we've never seen him make belt buckles. We were overjoyed to be able to buy several of his beautifully traditional buckles set with fine natural turquoise stones. 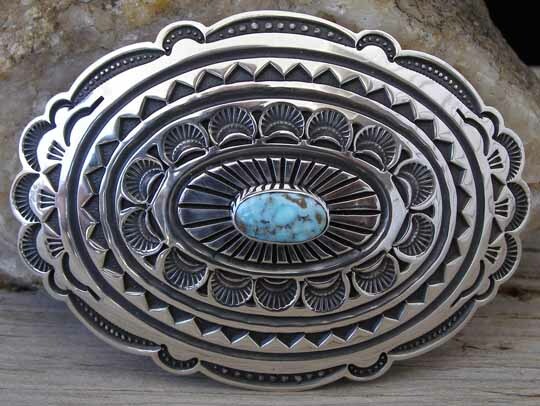 This buckle is set with an oval of natural, untreated Dry Creek turquoise. Stylized eagle feathers surround the stone and a series of concentric bands of stampwork radiate from the center to the sculpted edge of this slightly convex buckle. Hallmarked A.JAKE and stamped Sterling on back. Dimensions of buckle: 3" x 2 1/8"